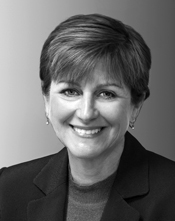 Carol G. Kaufman, CFP® – Firestone Capital Management – Listening, then leading. Carol G. Kaufman, CFP®, is vice president and senior partner of Firestone Capital Management, Inc. She specializes in wealth management for high net worth families. She joined Firestone Capital Management in 1996. After earning her undergraduate degree in finance with high honors at Emory University in Atlanta, Georgia, in 1978, she began her career as a commercial credit analyst and a commercial lending officer for the Manufacturers Hanover Trust Company in New York City. Her clientele consisted of closely held businesses and professional corporations. She returned to the academic world several years later and earned her MBA with a concentration in accounting at Syracuse University in New York. While taking a career break to focus on raising three daughters, she enrolled in the University of Miami’s program for personal financial planning. She became a CERTIFIED FINANCIAL PLANNER™ licensee in 1996. Carol is a member of the Financial Planning Association and the National Council of Jewish Women.